Former Utah Gov. 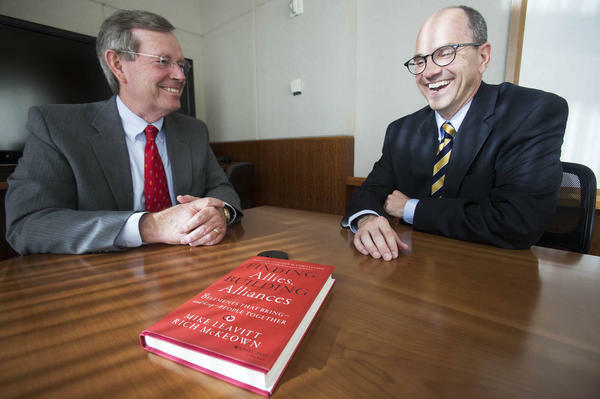 Mike Leavitt visits with Deseret News Editor Paul Edwards to discuss his recent book about how to manage complex problem solving through collaborative alliances. Published: Sunday, Oct. 6 2013. Last year, Deseret News CEO Clark Gilbert and I had the privilege of sitting down with Don Graham, longtime CEO and Chairman of the Washington Post Companies, to discuss innovations in the newspaper industry. Before Graham would talk shop, he wanted to talk about Utah politicians. And he quickly identified former Utah Gov. Mike Leavitt as a stand out. 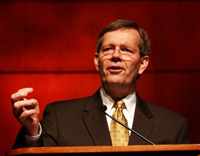 He spoke enthusiastically about Leavitt’s effectiveness in his cabinet roles as EPA Administrator and Secretary of Health and Human Services. He admitted he didn’t always agree with Leavitt’s policy positions, but he expressed undiluted admiration for Leavitt’s integrity and his success at bringing diverse people together to solve complex problems. It was against that backdrop of Graham’s informed praise for Leavitt’s effectiveness that I recently read the book “Finding Allies, Building Alliances: 8 Elements that Bring and Keep People Together” by Leavitt and his longtime colleague Rich McKeown (Jossey-Bass 2013). 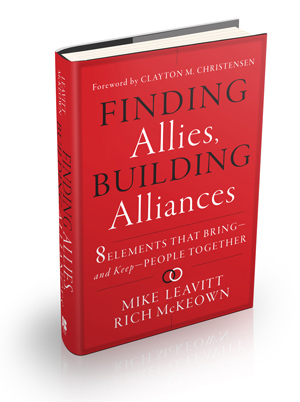 This concise and informative book, which is meeting with critical praise, uses helpful real-world examples from Leavitt and McKeown’s personal experience to provide a blueprint for collaborative alliances. I had the opportunity last week to visit with Leavitt at his offices in Salt Lake City and discuss the book. What follows are highlights from our conversation. Q: How did the elements for successful alliance-based problem solving begin to crystalize in your thinking? A: When I was governor, I began to recognize that with virtually every complex problem that we made progress on there was a formalized collaboration. In each of these situations you had dozens of different entities and opinions. I realized these were impossibly complex problems, unless you created some kind of construct for formalizing everyone affected by them. It was only once you gave shape to these things, and provided organization and leadership, that you started to make progress. But I realized I needed some criteria for deciding whether or not to invest in these processes. So I literally wrote down observations about what worked and what didn’t and began to refine those. It was a combination of my own observations, discussions between Rich and me, and then, when I was at the EPA and Health and Human Services, we had some ways to “pressure test” our criteria against real world experience. Some of this is intuitive to people, but you can get a lot better at it. So we concluded we ought to write about it because the insights are valuable. Q: Are there institutional or cultural bases for trust that are particularly useful for collaborative networks? A: Good alliances are essentially private special purpose governments that people voluntarily design in order to do something important. In a communist country the elements culturally and legally for that kind of thinking don’t exist. There, people come to a table because they are compelled to a table. Collaboration works only because people are there voluntarily, and the check and balance that keeps people there is the fact that if their situation ever gets to the point that they are better outside than inside, they can leave. It’s a marketplace of ideas and interests that keeps these things alive. It requires freedom and it requires the order of law. Something uniquely valuable about our democratic form of government is that we can, within the context of those laws, find ways to collaboratively solve problems in a very rapid way. Q: You identify eight elements required for successful collaboration. Are some elements more difficult to achieve than others? A: The second element – what we call a convener of stature has unique challenges. People who know how to use convening power are rare. Many a good idea fails because of lack of effective convening. I also think defining the written charter, our sixth element, is demanding because it is at that moment in time you discover if you really have a common interest. Those involved have to start dividing power and committing resources. Q: Are there any sectors you hope could particularly benefit from this type of problem solving? A: I wrote the book in large measure with the health care system in mind. Health care is an industry where everyone was operating as a general contractor. We are now finding the need to integrate and coordinate care. That means people in different businesses have to coordinate to achieve one result. But the entire world is now rapidly moving toward the need for standards. There isn’t a sector of the economy that isn’t affected by the need to work in networks. Q: What is “collaborative intelligence” and why is it so important? A: A critical point of the book is that you can get better at this. Cooperation is far more than just a cooperative attitude. It is a skill set and it starts with a recognition that there are times when your position is enhanced by making the whole more effective. Those who have an abundance mentality, as opposed to a scarcity mentality, tend to have collaborative intelligence. Collaborative intelligence is a willingness, at times, to subordinate one interest in order to gain an advantage with another interest; it is a willingness to, at times, subordinate control. And neither of those comes intuitively to most people. Q: How well do our political processes select for collaborative intelligence? A: Executive branches are well aligned to do this. In the federal budgeting system the most significant deficiency is that there is no way for departments to collaborate across the barriers of their budget. They are so siloed. And there are actual prohibitions against one department collaborating with others in order to solve common problems. Every federal department has a chief information officer, and you think you could get four or five of them to come together to solve a common problem, but it’s the budget process that gets in the way. The legislative process, on the other hand, is really devised in the opposite way: to centralize power and operate simply on the majority. And consequently very little collaborative thinking happens in legislative forums until there is a sufficient emergency. The first element is common pain. Legislatures are really designed to produce common pain so at the end of the day they can finally get something done. Look at what is going on today with the debate over the debt limit. That’s about creating enough common pain so that people will be incentivized to come together collaboratively to solve a problem. Q: How well does our educational system train for collaborative intelligence? A: I do see in business schools more of an effort to have people work together in groups. Most executive MBA programs and MBA programs will ask people to solve problems together, so I think there is an acknowledgement that many business activities, such as supply chains, are now is organized this way. Q: Much of your experience with alliances comes from within government. Did having governmental power affect the ability to convene these groups? A: There is power of some sort behind every sort of convening, whether real or perceived. In some cases it’s just respect. I draw quite a bit on the history of the Constitutional Convention in this book and I use George Washington as a very good example of a convener. He had no formal power; he was not a government official; he was just a highly respected person. People figured if George Washington is involved I probably should be there – something important might happen. And then when they got there they were well behaved because of their respect for him. So those are two critical elements. It’s not only the ability to get people to the table, it is the statement of a brand that they loan to the convening and then a component of behavior that comes as a result of their involvement. Paul Edwards is the editor of the Deseret News.